Asuncion, Paraguay: Dozens of suspected Brazilian gangsters blasted into a secure vault containing millions of dollars in southeastern Paraguay on Monday, leaving a policeman dead in what officials called the "robbery of the century." Some 50 gunmen with explosives and military-grade weaponry left the city of Ciudad del Este looking like a war zone after a two-hour overnight assault on a security firm and police headquarters, authorities and witnesses said. A joint Paraguayan-Brazilian police operation against the fleeing assailants on the country's porous border -- near the famous Iguazu waterfalls -- killed three suspects and resulted in "at least four arrests," Paraguay's interior ministry tweeted. The tweet showed a photograph of a policeman standing over the body of a man in bloodied camouflage clothing. Other pictures on the ministry's Twitter page showed what were apparently the getaway cars snared by police and a collection of captured ammunition and flak jackets. Brazilian authorities confirmed there had been a deadly clash but would not give more details. "There was an exchange of fire," a federal police source for the state of Parana told AFP. "There were dead and wounded but we are not giving more information for now. We're still looking for people." Brazilian President Michel Temer promised to support Paraguayan police "with all necessary resources." "The Brazilian government expresses solidarity with the victims of this criminal act and, especially, with the relatives of the dead Paraguayan policeman," he said. Shocked Paraguayan officials said it was an unprecedented attack for Ciudad del Este, a key trading hub near the borders of Brazil and Argentina in an area linked to drug gangs. The target of the raid was Prosegur, a firm specializing in safely transporting cash. Far from simply overwhelming security at the facility, the raiders caused multiple diversions around the city, setting vehicles on fire to block roads and detonating explosives near police headquarters. "The noise rang out around the city like bombs in a war," one man who witnessed the attack, Antonio del Puerto, told AFP. Television images from the scene showed the Prosegur building was virtually destroyed, with rocket casings lying around and burned-out vehicles in the streets. Police reports said the attackers included members of First Capital Command, one of Brazil's most powerful drug gangs, which is based in Sao Paulo and has fought turf battles in Rio de Janeiro and across the country's prison system. Public prosecutor Denise Duarte said the men wore masks and spoke Portuguese, the language of Brazil. It remained unclear just how much the assailants made off with. Duarte said the Prosegur vault "was full" at the time of the robbery. Police said the vault can hold up to $40 million in cash but authorities had yet to verify the amount. The attackers abandoned several vehicles at the site, including armored trucks, one of them mounted with what was described as an anti-aircraft gun. 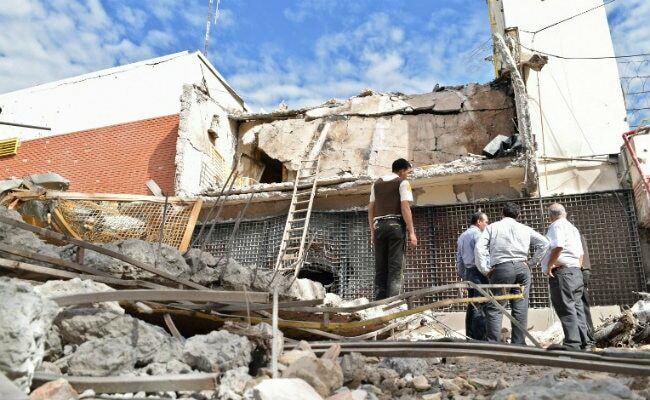 "The security firm's premises has been destroyed and the attack caused chaos and terror in the city," the governor of surrounding Alto Parana state, Justo Zacarias, told reporters. "Nothing like this has ever happened in Paraguay." Paraguay's police chief Luis Rojas said it was "very feasible" that the attackers had help from within the police force. He said he had contacted security forces in Brazil and Argentina to help catch the robbers. "I am going to seek the resources and the best men to work to catch these people," he said.